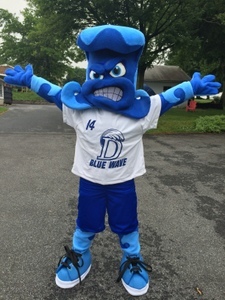 For twenty years the Darien Blue Wave mascot has been slowly losing it's "current" imagery to fresher designs. So we surfed out some new looks for their classic wave logo and gave him tidal colors in his arms and legs. Muscular and ready to sail the seas, the Darien Blue Wave will proudly wear the Class of 2014 on his sleeve so future students know the spirit of these graduates will always be with their high school.